I recently received the book The Elements of Dessert as a birthday gift, and I've found it to be a goldmine of inspiration. At first glance I knew the recipes would be aspirational for the home baker. There are formulas and techniques therein that I may never use, (remember my feelings re: molecular gastronomy?) but the desserts are so utterly gorgeous, so playful. It made me seek out answers to new questions (pre-desserts? anhydrous butter? douglas fir milk?) and better, it made me want to reach for something outside my comfort zone. One thing used throughout the book is chocolate texture spray. 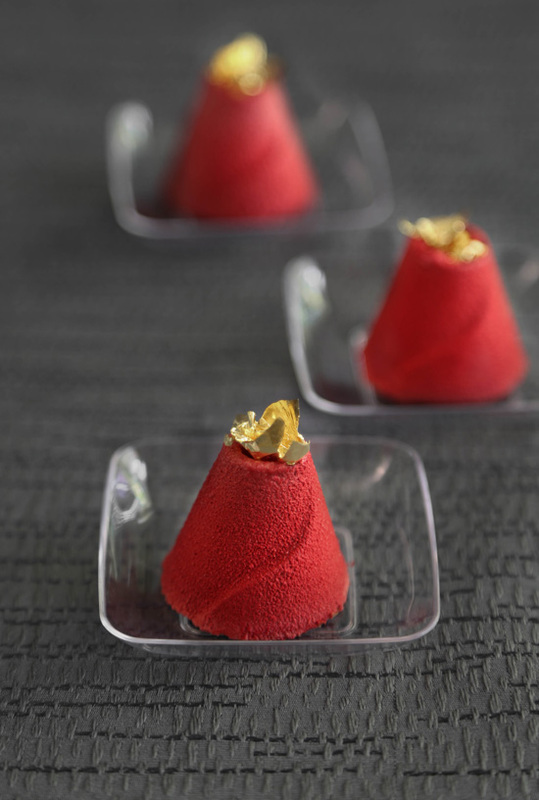 Professional pastry chefs use this mix of cocoa butter, chocolate and pigment to create the most beautiful velvety texture on confections. I fell in love. I had to try it, but alas, during my research and forum-stalking I decided that I wasn't quite ready to commit to buying a paint sprayer and air compressor for the task. So, I found the next best thing. Velvet texture in a can! It's so much fun to use, but it is a little pricey - anywhere from $18-$38 per container depending on where you shop. Due to expense, the paint sprayer may be worth the investment. It's likely in my future because I'm head-over-heels for the aesthetic. 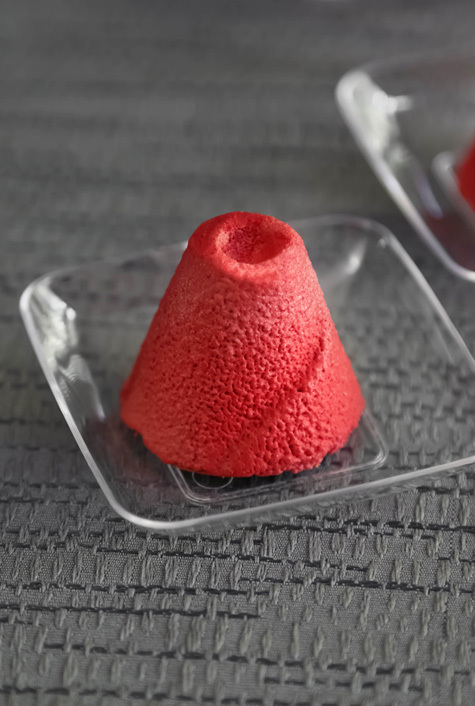 A few things to remember if you try the spray for yourself - 1) The dessert must be frozen before you cover it with the texture. 2) Use a large cardboard box in which to spray your dessert. Turn the box on its side with the open end facing toward you. Place cellophane tape over all holes and crevices in the box. As you can see above, the stuff goes everywhere. 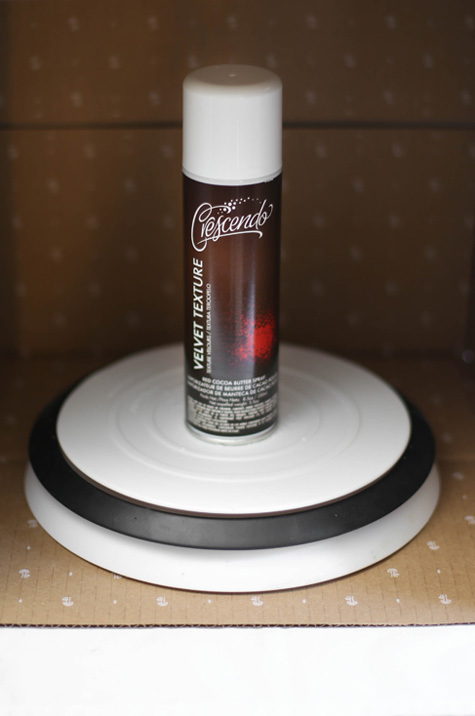 3) A lazy susan will help with 360-degree turning so you can easily spray the entire surface of the dessert(s). 4) Consider covering the floor in front of the box with newspaper. Even though I felt sure my spray was contained, my shoe found a cocoa butter slick just below the box opening. A little less than half the can was used for two dozen chocolates. A good bit of the texture fell on the plate the chocolates were sitting on (I cautiously sprayed 6 at a time), so next time I think I'll use it on a larger dessert like cheesecake or mousse cake - something with a little more surface area. That said, these were so much fun to make! 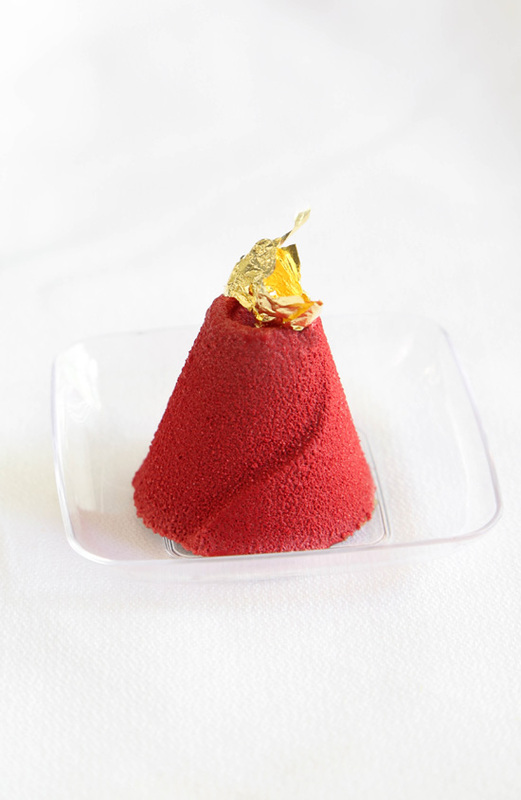 The red spray is a nod to the heat inside, and I placed a little "blaze" of gold leaf on top. Now, as far as chocolate bon-bons are concerned, caramel-filled is my favorite. If you're a caramel-lover like me, then I urge you to try black pepper caramel (even if it's just on top of ice cream!). It's zingy without being too hot or overly spicy. The caramel firms with refrigeration, but at room temperature it becomes soft and will spill out of the chocolate shell when bitten. You'll need a mold -like this inexpensive one from FreshWare- and a pound of chocolate for the shells. I suggest using milk chocolate for this particular caramel filling. Semi/bittersweet and dark chocolates may mask the subtlety of the black pepper. It may not be absolutely necessary to temper the chocolate for these bon-bons if using the texture spray, but I really love the snap tempered chocolate gives when you bite into it. It also yields a thinner shell, which makes more room for all that glorious caramel. 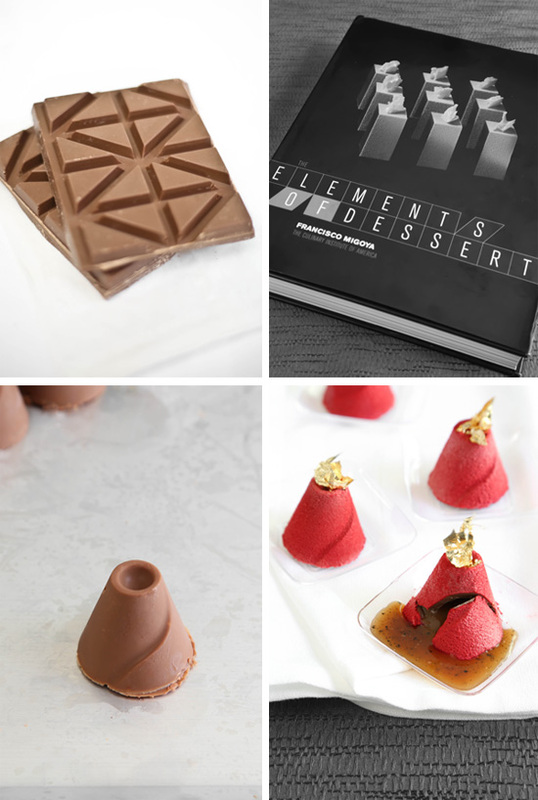 Below you’ll find the tempering method from the SprinkleBakes book. Place two-thirds of the chocolate in a metal bowl and place the bowl over a saucepan of barely simmering water. The water should be gently simmering, not boiling, and the bottom of the metal bowl should not touch the water. Avoid getting water into the chocolate as you melt it over the simmering water. One accidental drop and the chocolate will seize—that is, turn grainy and harden in a chunky mass. Insert a candy or chocolate thermometer into the chocolate. Carefully fold the chocolate with a rubber spatula to ensure even heating as it melts. Bring the chocolate to 110°F (120°F for semisweet and dark). Do not let it exceed this temperature, or the chocolate will bloom. When chocolate blooms, the butterfat rises to the surface as the chocolate solidifies, creating an unsightly white coating. Remove the metal bowl from the simmering water and wipe the condensation from the bottom of the bowl with a dishtowel. Add the remaining chocolate a little at a time. Stir, waiting until each addition is melted before adding the next. Continue adding the chocolate, stirring until smooth. When the chocolate’s temperature drops to 82°F, return the metal bowl to the simmering water and bring the temperature to 88°F. This will only take 5-10 seconds, so move the bowl quickly from the bain marie and fold well with the rubber spatula before gauging the final temperature. Pour chocolate into the cavities in the silicone mold. Place the mold on a baking sheet and rap on a work surface one or two times to release trapped air bubbles. Turn mold over and pour excess chocolate back into the metal bowl. Scrape excess chocolate off the flat surface of the mold with a large off-set spatula. Allow chocolate shells to set at room temperature. Leftover chocolate can be kept warm with a heating pad placed under the metal bowl and set to “low”, otherwise, reheating over the simmering water will be necessary. Be sure to reserve additional chocolate for closing the caramel-filled shells. I use this caramel as a filling for chocolates, but it's also good poured over vanilla ice cream. Melt the sugar over medium-high heat in a large pot. Gently prod sugar with a wooden spoon as it melts, and cook until it becomes a deep amber color. Add the butter and stir it in until melted. Pour in the heavy cream (the mixture will foam) and whisk until the mixture becomes a smooth sauce. Note: If lumps form, keep stirring over gentle heat until they have melted. Remove from heat and stir in vanilla extract. Stir in black pepper. Transfer to a heat-proof glass bowl for cooling. Allow caramel to cool until barely warm but still pourable. Fill chocolate cavities with caramel. Gently reheat leftover chocolate (over a bain marie as before if you did not use a heating pad) and pour over filled caramels. Scrape excess chocolate off the surface of the mold with a large off-set spatula. 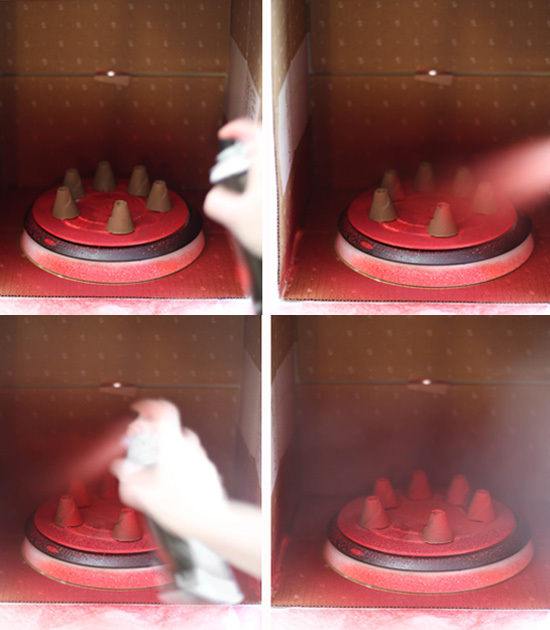 Allow chocolate to stand until set, or if using chocolate velvet texture spray, place mold in the freezer. Unmold chocolates and garnish as desired. If using texture spray, follow directions on the can and see the above blog post for my spraying method. Store caramel-filled chocolates in the refrigerator. I have wanted to make home made chocolates for awhile but never got the confidence. I think i may have to get this book and try this recipe! wow, wow, wow!!! You are so fun! I'd be totally scared to try something like this, but you make it look doable! Wow these are beautiful. I love the volcano inspiration, very fun! Pretty and absolutely divine! I love their shape and color. These are so pretty! What a fantastic idea!! Those are so cool looking and the spice/caramel combo sounds wonderful! That is fabulous! They are too pretty to eat, but imagine all the different caramel flavors you could fill them with. That is pretty pricey though for the spray...Yikes! These are incredible!! So gorgeous and inspiring! I've considered home made chocolates before but it all seems like so much work. :) They're gorgeous! I love that velvet spray thing! It looks so beautiful on the chocolate! It looks so spongy and soft. Does it taste good? It must because otherwise people wouldn't put it on foods. But I think that would look great over some chocolate cheesecake. Oh wow! They look stunning! 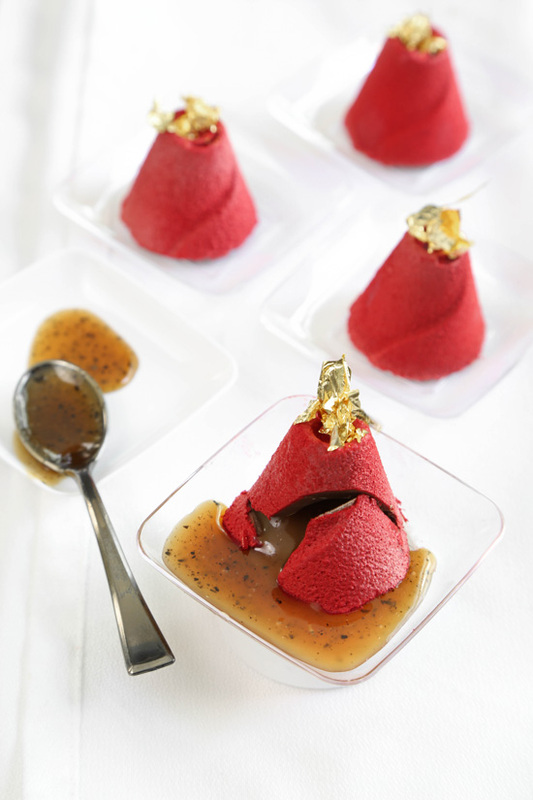 This looks really hard to do, but super decadent! Look @ those li'l beauties. Great idea w the black pepper. such a pretty pepper chocolates.. my hands are itching to try it. Caramel filled chocolates are still one of my favourites and one of the first confections I try to size up a chocolatier. I have never had one in a shop anywhere that satisfied - even Pierre Herme's version is too tame for my palate. I never thought of adding black pepper - usually some lemon zest and vanilla. Beautiful pics by the way - little red heart attacks on a plate! Hi, Heather! What kind of chocolate are you using, in the picture above? I think I recognize it, but I can't be sure... :) Thanks! And this looks beautiful. I love the look of this pepper caramel chocolate! Nicely presented! Maravilloso...da gusto ver este tipo de recetas.